The New Year is right around the corner, and for photographers around the world that means just another opportunity to take some incredible photos! Photographing fireworks can be tricky, but here’s a few quick tips to make sure you walk away with a bunch of keepers to choose from. Sony α7R II. Sony FE 16-35mm F4 ZA OSS lens. 2-sec., f/11, ISO 400. 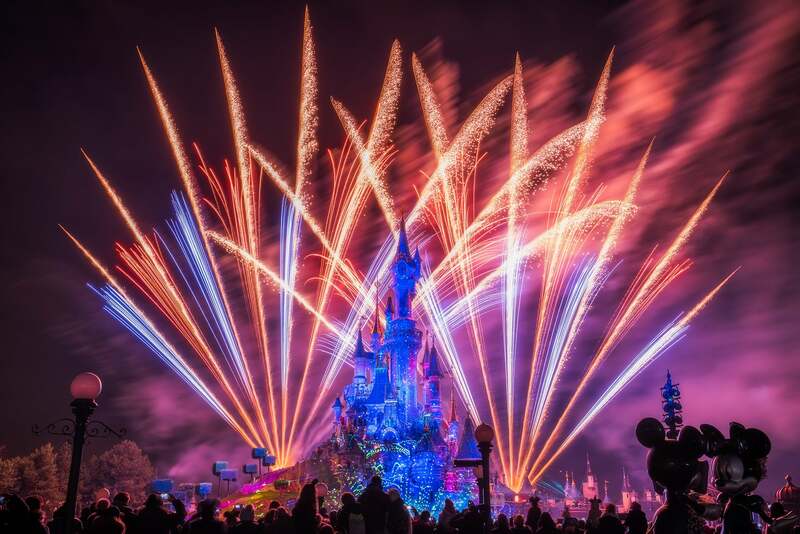 Taken on a family trip to Disneyland Paris, I used the five techniques outlined in this article to make this dramatic photo of the fireworks show at the Cinderella’s Castle. Fireworks are like waterfalls: Sure, you can photograph them at 1/1000th of a second, freezing everything in place, but the image will lack movement and soul. You’ve got to get your camera on a tripod so you can slow that shutter down and drag those fireworks across the screen as they soar through the air. I shoot in Manual about 95% of the time but if you’re just not comfortable with that, Shutter Priority is your next best bet. A shutter speed of 1-2 seconds is a good starting point. ISO and aperture will depend on the conditions but as you can see, I was at ISO 400 and f/11. The great thing about Back Button Focus is that you have auto focus available when you need it, and manual focus available when you don’t. There’s no need to flip switches on lenses or go into menu settings. In the scene above, I placed a single focus point on the castle because it was always well-lit and easy to focus on. It was also far away and in the same area as the fireworks, so I knew everything would be in focus. With Back Button Focus, I could photograph the fireworks without the camera refocusing every time I pressed the shutter button. Then, every few minutes, I’d hit the focus button just to ensure focus was still set. A two-second timer just isn’t going to work for fireworks. You need to be able to anticipate the fireworks going off, starting the exposure as soon as you see them explode or shooting into the air. If you have the Camera Remote app installed on your camera and smart phone, that works great. If you don’t have the app or it’s not available for your camera, a separate remote control will work well. Both the app and the remote controller allow you to start the exposure without touching the camera. If you don’t have access to some kind of remote, as long as your camera is on a sturdy tripod, you can still get sharp images by pressing the shutter with your finger, as long as you’re careful not to move the camera. That’s the situation I was in at Disneyland Paris! I photographed the fireworks two nights in a row, taking hundreds of 2 second (or more) exposures and they were all in focus. This is a crucial step, especially if the place you’ll be photographing from will be crowded. Don’t make the mistake of getting there right as the show starts and attempting to open up your tripod in a crowd of people and trying to get it high enough to shoot over everyone’s heads. For the Disney show, I got in position about 45 minutes before the show began. The castle had a bunch of garden areas with low fencing around them, so I found a spot on the backside of one of the garden areas. This meant there would be about 30-40 feet between me and the next person in front of me. Put these tips into action and you'll be set to ring in the new year with your best ever fireworks photos.